Vivienne's Pastimes: Whatever happened to E? Enough of the distraction posts, or the being totally distracted from posting non-posts (because there was only one thing on my mind, and it wasn't precisely bloggable. 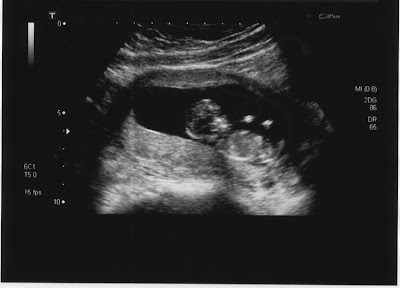 Somewhere in there (mostly to the right) is a baby of 12 weeks and 3 days. Nicely beating heart, very active (if stubbornly refusing to get into the proper position for measurements to be taken). Due around the 30th of October. If I had been posting over the last few weeks, instead of falling asleep, it would have been a litany of "felt sick, was sick, felt sick again". That stage, fortunately, seem to be ending gradually. Now we just have to do growing and waiting. So far just a pair of socks - until today I was feeling convinced that I wasn't really having a baby, just a stomach bug and an overdose of biscuits, so didn't want to start anything substantial. We're nearly a third of the way through now, so I'd better get my needles moving a bit faster. Oh, well done :) I'm looking forward to seeing the knitting too.